Yuuki and Premiere look-alike also detailed. 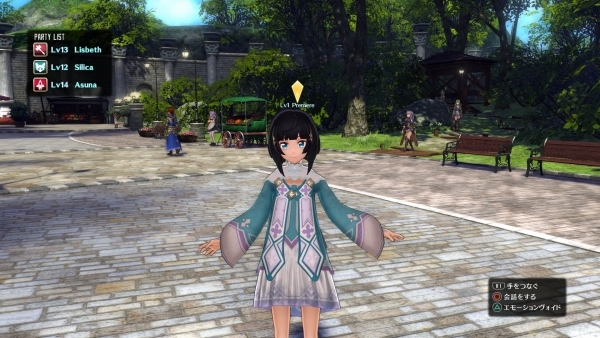 Bandai Namco has shared new information about Sword Art Online: Hollow Realization, detailing the “βeater’s Player Edition” of the game available a week early to users who pre-order the game via the PlayStation Store in Japan, as well as the latest characters and other bits. Additionally, Dengeki Online has gone up with the first gameplay footage of the game running on PS Vita. 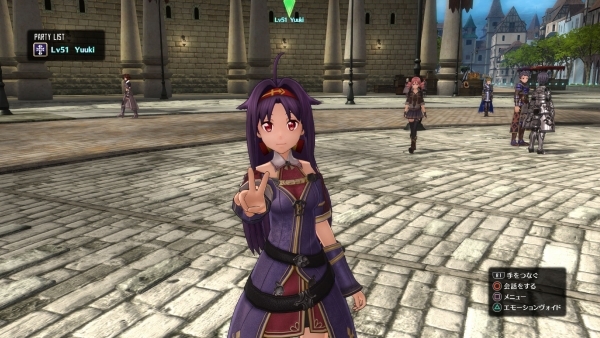 Contrary to her lovely appearance, Yuuki is a remarkable Sword Skill user, and a go-getter swordswoman known by the nickname “Absolute Sword.” Just like Kirito and the others, she participated in the beta test for “Sword Art: Origin.” She wields a one-handed sword in Sword Art: Origin and fights alongside them. It appears that there may also be a Pillow Talk scene with her. A mysterious NPC who looks exactly like Premiere. She has a cruel expression, but could her true intentions be? 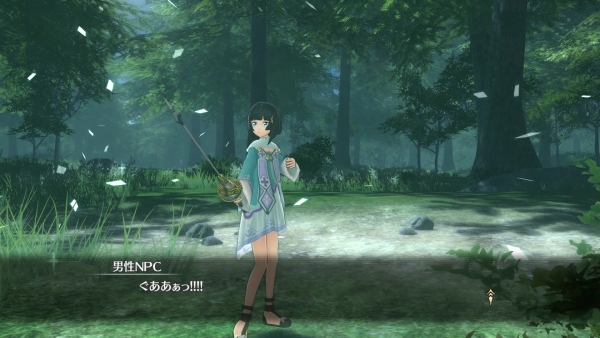 Sword Art: Origin is a death game for NPCs. 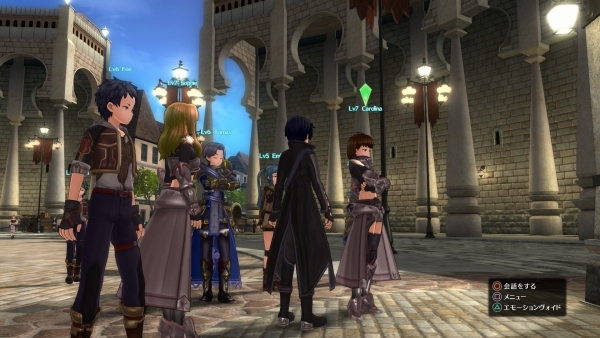 Within the town are both logged in Sword Art: Origin players and NPCs created by the Sword Art: Origin system. Each character has their own personality and traits. These are the other players logged in to Sword Art: Origin. Asuna, Leafa, and others are among them. If they die out in the field, they’ll be able to resurrect with “return by death.” These players are indicated by a green cursor over their head. 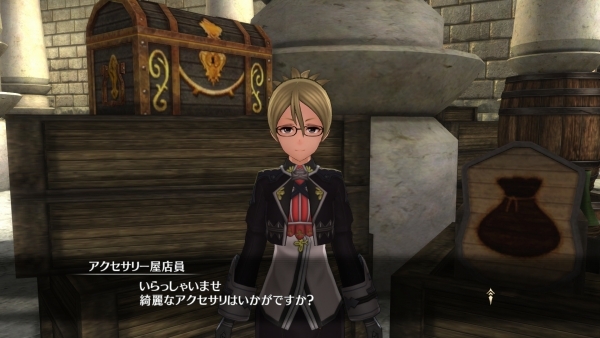 AI characters created by the Sword Art: Origin system that can be recruited as party members. Each and every one of them is unique, and if they die they do not return. These players are indicated by a yellow cursor over their head. NPCs without names assigned to roles created by game system. They cannot be recruited as party members. When AI players who possess roles such as shop assistant die, they’re replaced by a nameless NPC. Story – Play up until the battle against the boss of Stage 1. In total, it is about 10 to 15 hours of total play volume. Level Cap – Raise your characters until level 20, NPCs included. Weapon Proficiency – Each weapon type can be developed until 200. In the full version, the limit is 1,000. Some Skill Unlocks, Excluding High-Rank Skills – You can unlock skills by raising your weapon proficiency and obtaining skill points. Quests – Play as often as you like within the extent of Stage 1. It’s possible to gather materials and such, as well as challenge powerful evil god-class enemies. Friendship – You can raise your Friendship level until 3. Recruit Allies – Take on quests to raise your Friendship level, and recruit other players and AI players. Trophies – Acquire Trophies that are possible to acquire within the extent of what is available to play and carry them over to the full game. AI NPC Characters – AI NPC characters who die can never be encountered again. Dates – Dates and Pillow Talk will not be available until the game launches. Network certification is required upon startup. If you’re not connected to the network, you cannot be certified. While playing the βeater’s Player Edition, you won’t receive bonuses for having save data from the previous games. You will, however, receive these bonuses in the full version. Save data from the full version is not compatible with the βeater’s Player Edition. You won’t be able to play the βeater’s Player Edition after the release date. The βeater’s Player Edition will not feature multiplayer. After importing your save data from the βeater’s Player Edition to the full game and saving the game again, the save will be incompatible with the βeater’s Player Edition. Each chapter costs 1,000 yen, A Season Pass including all three chapters and a bonus “Wedding Dress” costume for Asuna will be available for 2,500 yen. “Extra Skills” are skills that can be set one per character and greatly influence your play style. Attackers, Tanks, Healers, and such will be able to learn unique skills that assist in their play style, but there are also even higher-rank Extra Skills. These are difficult to learn, but you’ll be able to obtain an even greater play style by doing so. If you missed it earlier this week, catch the latest set of screenshots here. Sword Art Online: Hollow Realization is due out for PlayStation 4 and PS Vita on October 27 in Japan, and November 8 in North America and Europe. In North America, the PS Vita release will be digital-only. Watch the PS Vita gameplay video below.